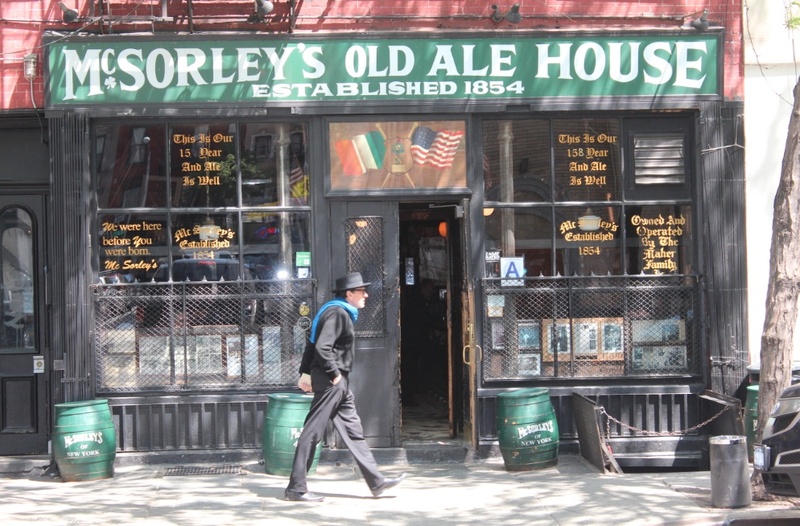 NEW YORK, NY – I almost didn’t write a piece on McSorley’s. I assumed that a place trading so heavily on its longevity (more on that below) through the medium of extensive verbiage on its windows would be a horrible tourist trap. And, indeed there are quite a few tourists at McSorley’s. But there is also a great deal of charm to this place and, in the end, I was glad I made the trip. McSorley’s tells us that they were established in 1854 but – based on property and census records – there has been a bit of dispute over this. Even so, we’re only talking about potentially a few years difference so the motto on their window, “We were here before you were born”, is true either way as is the fact that McSorley’s is New York’s oldest continuously operating bar. Apparently nothing has been removed from the walls since 1910 and it shows – stepping into McSorley’s is like walking into a time capsule, between the old wall hangings (including news articles about the bar’s notorious “Men Only” policy in place until 1970) and the original fixtures including a potbelly stove smack dab in the middle of the joint. You’ll also find a chatty bartender and an eclectic mix of regulars swapping stories and jibes while standing at the bar (no barstools, just like a proper old-school Irish pub). If you’re the sitting type, there are tables throughout the establishment and – surprisingly – there is table service. One thing you will NOT find at McSorley’s is a variety of beverages. 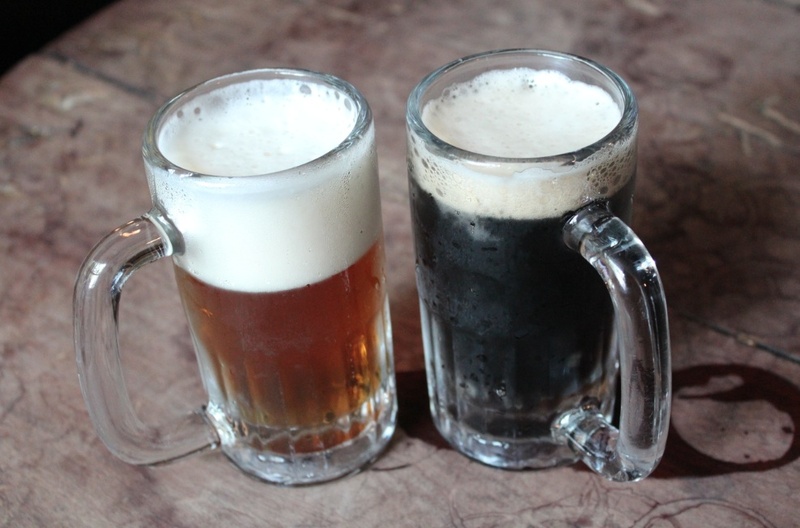 You get two booze choices here – light ale and dark ale. That’s it. So, if you’re not a beer drinker your only other option – according to the bar’s website (I stuck to ale, so I don’t know about this first hand) – are house sodas. The beer is an ok deal – $5.00 for two half-pints (yes, they only serve ale in increments of roughly 8 oz pours – quirky!). There is also a limited food menu, with the cheese plate apparently being the best option. My tip here: arrive early. Very early. This place gets absolutely rammed, so much so that it’s quite impossible to get in or out when it’s at its busiest. 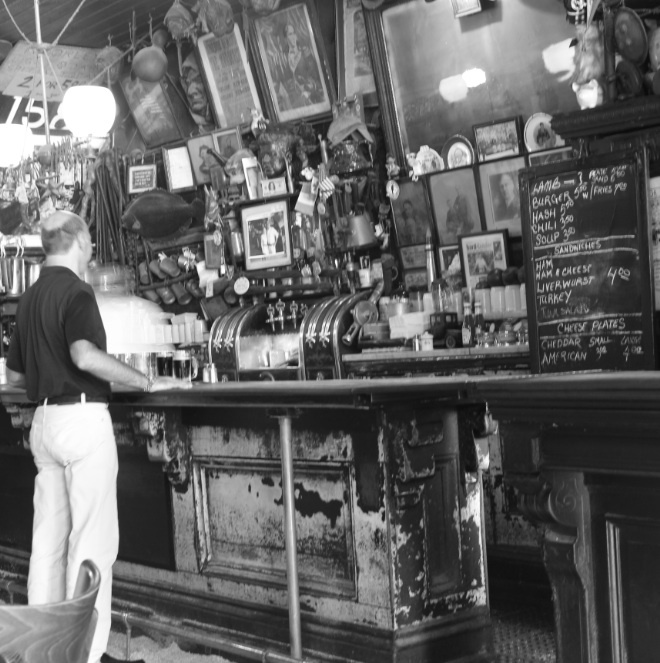 What is the little thing that makes McSorley’s worth a visit? Genuine – not faux – old-school charm and a whole lot of history hanging on the walls. Where is it? 15 East 7th Street (a stone’s throw from Cooper Union), New York.